Please apply for your Degree (Final Degree Check) on Ulink. 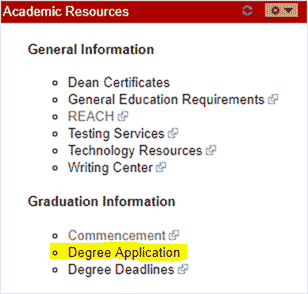 You should apply to graduate (final degree check form on Ulink) just before the beginning of the semester in which you intend to graduate. Make sure you have spoken with your professional and faculty advisor to determine if all degree requirements will be met. Filling out this application will put your name on the list of potential graduates. If you have any questions please contact your professional advisor. You cannot be granted your degree until you complete the degree application during the semester in which you intend to graduate. All A&S degrees require a minimum of 121 or more credit hours to graduate. All A&S degrees require a minimum of 50 credit hours at the 300-level or higher. 30 of your last 36 hours must be taken at the University of Louisville (unless you are participating in a study abroad program sanctioned by the university).